So regardless of how a reader views this imaginative story, it’s not applicable to the eternal fate of unredeemed people. It amazes me how often this tale is brought up when discussing the topic of eternal damantion with others. Anyone who utilizes this story to support eternal conscious torture hasn’t studied the subject of human damnation to any great length. Greek scholar E.W. Bullinger maintained that Jesus was using the Pharisees own teachings and own words to convict them. This makes sense for two reasons: 1. The story, if taken literally, blatantly contradicts what the rest of Scripture teaches about Sheol, including the LORD’s own descriptions, as detailed in Chapter Six’ The Longest and Most Detailed Passage on Sheol (read the following section on “progressive revelation” as well). And 2. the Pharisees embraced the unbiblical Hellenistic concept of the immortal soul apart from Christ and, consequently, eternal roasting of damned souls. As such, Jesus’ parabolic tale mimicked their beliefs with the twofold purpose of rebuking them and conveying one of the most important themes of the Bible, both of which we’ll extract from the story in this chapter. Jesus Himself is the living “Word of God,” so he’s not going to contradict the written Word of God. This is another key that the story is not to be taken literally. After all, anyone—regardless of sectarian mindset—who simply does an honest, systematic study on Sheol in the Bible will admit that a literal reading of Jesus’ tale contradicts what the entire rest of the Bible teaches about Sheol. As the previous seven chapters of this study have shown, many of the most important men of God in the Old Testament, and even the LORD Himself, describe Sheol as the world of the DEAD where souls ‘sleep’ in death until their resurrection & judgment (and by ‘sleep’ I don’t mean literal snoozing, but rather the condition of death itself—i.e. non-existence as far as conscious life goes; please read the previous seven chapters before automatically assuming that this is erroneous; if you haven’t, you can start here). No one’s roasting in conscious torture crying out for tiny bit of water; and neither are (or were) Old Testament saints chummin’ around with father Abraham in paradise. Jesus said the TRUTH will set us free, which is God’s Word (John 8:31-32 & 17:17). By contrast, that which is false cannot set us free, because it’s not true. Believe it or not, the LORD and godly characters in the Bible have been known to set out “stumbling blocks” to intentionally discombobulate proud fools, whether legalists or libertines; see, for example, Ezekiel 3:20, Romans 11:9 and Psalm 69:22. I’m not saying there’s no hope for these people. I’m very patient and merciful; in fact, my ministry is all about setting the captives free, including those who are figuratively blind. I want to stress that I’m not suggesting that everyone who regards the story of the rich man and Lazarus as a literal description of life after death is a modern-day Pharisee, not at all. Again, most are simply ignorant on the subject. I wrote Sheol Know for just such people. I said above that the tale of the rich man and beggar “if taken literally, doesn’t gel with what the rest of Scripture teaches about the nature of Sheol, including God’s own descriptions;” I also said “Jesus Himself is the living ‘Word of God,’ so he’s not going to contradict the written Word of God.” Both statements are rooted in the hermeneutical rule that Scripture interprets Scripture, which is a common sense guideline for proper biblical interpretation. Without this rule people could take any passage in the Bible and declare that it means whatever they say it means, which Peter condemned when he said, “no prophecy of Scripture is a matter of one’s own interpretation” (2 Peter 1:20). In other words, the way you interpret a passage is 1. 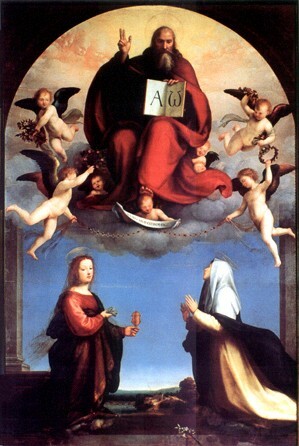 According to its immediate context where the surrounding texts usually indicate the meaning of the passage; and 2. According to the context of the whole of Scripture whereupon you ask: What does the rest of the Bible say about this particular subject? The clearer or more detailed passages obviously take precedence over the more ambiguous and sketchy ones. As you can see, the devil—who knows the Bible verbatim—was attempting to use a biblical passage to spur Jesus to do something wrong, but Jesus didn’t fall for it because he followed the principle of interpreting Scripture with Scripture. So He responds, “It is also written…” In other words, the verse the devil quoted must be viewed in light of what other passages say. When a person fails to do this they inevitably get off track and fall into error. The problem with error is that it’s not true; even partial error is not wholly true; and it’s only the truth that can set people free, as the Lord taught (John 8:31-32). If taken literally the Parable of the Rich Man and Lazarus does not support either Old Testament or New Testament theology, which is another blatant indication that the tale’s not to be taken literally. 1. If one is prosperous, gives to the poor,* respects authority and is concerned about his loved ones, he will go to Sheol at the point of death and suffer constant roasting torment desperately hoping for less than a drop of water for relief, but it won’t be given. *NOTE: For those who argue that the rich man didn’t give anything to Lazarus, why else would the beggar be laid at his gate (verse 20) if he wasn’t receiving anything from him? It would be pointless. 2. If one is poverty-stricken, diseased, has no faith to be healed, is not physically blessed of God and has a life of bad things, he will go to the paradise compartment of Sheol to hang out with father Abraham and be perpetually consoled and comforted. Please notice in the passage that Christ plainly informed the disciples that Lazarus was dead and not chumming around with father Abraham in some curious paradise in the nether realm. Also observe that Lazarus’ sisters — Mary & Martha — were horribly mourning his death, as well as many others (verse 33). Why were they mourning so severely if going to Sheol for Jews meant blissful fellowship with father Abraham? Furthermore, why would Christ resurrect Lazarus and bring him back to this lost, corrupt world? Wouldn’t it be better for Lazarus to chum around with Abraham in wonderful bliss than come back to this dark world? These factors are just further evidence that the story was never meant to be taken as a literal account of the nature of Sheol. It’s symbolic, meaning it’s a parable—a figurative story. 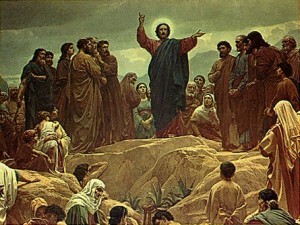 This is in line with the generality that Jesus “did not say anything to them without using a parable” (Matthew 13:34) and that Jesus’ story of the rich man and Lazarus comes in a long line of parables: The whole first half of Luke 16 is a parable that starts with the same exact words as Jesus’ tale of the rich man and Lazarus; and Luke 15 consists of three other parables. It simply makes no sense that Jesus would suddenly switch to giving a supposedly historical account that contradicts what the Word of God has plainly established about the nature of Sheol up to this point. Add to this the fact that the story clearly contains fantastical elements. For instance, the rich man is in literal agony in the fire and so he asks Abraham to have Lazarus dip the tip of his finger in water so he can cool his tongue—not even his hand or finger, the tip of his finger! Like that’s going to help his roasting condition one iota. It’s as if Jesus was getting a megaphone and declaring, “This is a fantastical tale that is not meant to be taken literally!” How much more evidence do people need? With the understanding that this is a fantastical symbolic story, Jesus knew that unspiritual people would wrongly interpret it as a literal account of the nature of Sheol in centuries to come, just as Nicodemus misinterpreted Jesus’ statement about being born-again to refer to literal physical rebirth (John 3:3-4). Please understand that Jesus didn’t tell parables to reveal truth to the masses, but rather to hide it for those with spiritual discernment (Matthew 13:10-15 & 1 Corinthians 2:14). As such, the Parable of the Rich Man and Lazarus is a stumbling block to the carnal person—those who are spiritually blind—including religious people with a Pharisaical spirit. 1. Although the Pharisees claimed to strictly follow the Torah—God’s Law—they really didn’t. The reference to “Moses” is a reference to the Law; and “the Prophets” refers to all the prophets who rebuked Judah & Israel’s wickedness in times past and were rejected. In other words, Jesus was saying that the Pharisees and other religious leaders of Israel were not who they claimed to be—devout men of God who strictly followed the Law. No, they were hypocrites, which literally means actors. In fact, Jesus blatantly told them this to their faces on other occasions, as shown in Luke 11:37-54 and Matthew 23:13-35. In short, the Pharisees were fakes. 2. Since the Pharisees and other Judaic leaders weren’t really listening to Moses and the Prophets—even though they put on airs that they did—they wouldn’t likely believe even if someone rose from the dead, which is not only a reference to Jesus’ later resurrection, but also to Martha & Mary’s brother, Lazarus — noted above — whom Jesus raised from the dead, as seen in John 11:1-44. This is one of the reasons Jesus utilized the name ‘Lazarus’ for his parable. You see, many people believed in Jesus because of Lazarus’ resurrection, but not the proud, stubborn religious leaders of Israel; in fact, they proceeded to plot to kill Lazarus—as well as Jesus—because so many people believed on account of Lazarus’ awesome resurrection (John 12:9-11). Unbelievable, isn’t it? This shows why Jesus shared the parable in an effort to rebuke these disingenuous religious authorities. As far as them not having faith even after Jesus later rose from the dead, this is precisely how history panned out: When Jesus was resurrected, the Pharisees and other stuffy Judaic rulers refused to believe it and hence tried to stamp out those who did believe in Christ and his resurrection. The few Pharisees who humbly repented were the exception, like Nicodemus and Saul, who became Paul. Now, notice the key words in Jesus’ punchline in verse 31: The Pharisees and other hypocritical Judaic rulers wouldn’t believe even when the Lord rose from the dead. You see, Jesus died and his soul went to Sheol (Hades) when he was crucified. In other words, Jesus himself described the condition he was soon going to experience in explicit terms of being dead. If Jesus’ story of the rich man and Lazarus was a literal account of life after death and not a fantastical tale Jesus would have said something like, “If they do not listen to Moses and the Prophets, they will not be convinced even if someone rises from blissful communion with father Abraham in the paradise compartment of Hades.” Sounds absurd, doesn’t it? Yet this would be what Jesus really meant if his story of the rich man and Lazarus is taken literally rather than symbolically. Of course, Jesus said nothing of the kind. 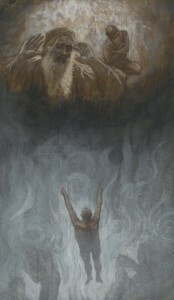 He indirectly declared that he was going to rise from the dead, which perfectly coincides with the Bible’s clear descriptions of Sheol/Hades as “the world of the dead,” as scholar James Strong defined it, or “the company of the dead,” as Proverbs 21:16 defines it, or “the realm of the dead,” as the New International Version translates it on a number of occasions, e.g. Isaiah 14:9,15, Ezekiel 31:15,17 and 32:21,27 (the verses from Ezekiel, by the way, are the LORD Himself speaking). Of course, there are some ministers who teach that Jesus didn’t go to be with Abraham in Sheol; instead they maintain that he was tormented in fire for three days & three nights, like the rich man in the story. If this were so, Jesus’ punchline would’ve been something akin to this: “If they do not listen to Moses and the Prophets, they will not be convinced even if someone rises from three days & nights of fiery torment in Hades.” Whether a person holds to this interpretation or the other one it doesn’t matter because Jesus said nothing of the kind. He plainly said that he was going to rise from the dead, not rise from comforts in paradise with Abraham or rise from horrible roasting agony. Neither belief washes with the Scriptures because they’re false doctrines based on an erroneous interpretation of a tale Jesus told that is clearly parabolic and fantastical in nature, not literal. In the Bible, the Word of God is likened to spiritual food and compared to bread (Matthew 4:4 & Deuteronomy 8:3). In verses 20-21 we see Lazarus being laid at the rich man’s gate and hoping for crumbs from his table. 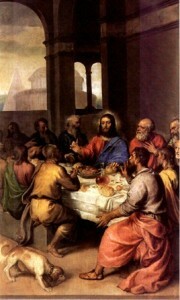 This was the way it was for Gentiles during the Old Testament period: The Israelites were blessed with the Word of God—spiritual bread—while Gentiles rarely heard God’s word and essentially settled for “crumbs” from the Israelite’s table, which perfectly coincides with the Gentile woman’s response to Jesus in Matthew 15:27 when he told her that it wouldn’t be right to take the children’s bread—the Israelite’s bread—and toss it to “dogs,” i.e. 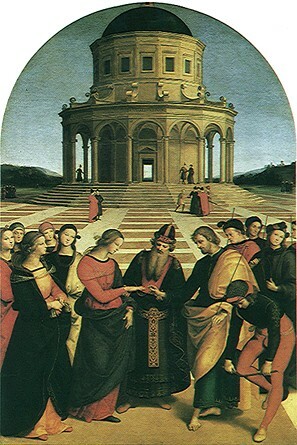 the Gentiles. Her response was brilliant and showed great faith & persistence: “Yes, Lord, yet even the dogs eat the crumbs that fall from their masters’ table” (NRSV). In short, the rich man and poor man refer to spiritual riches and spiritual poverty. If you have a covenant with God you’re spiritually rich; if not, you’re poor, no matter how much material wealth you might possess. The rich man refers to the Hebrews who had a covenant with God, which is verified by the statement concerning his brothers having “Moses and the Prophets” (verse 29) while Lazarus is figurative of the Gentiles who through faith in Christ become “Abraham’s offspring” (Galatians 3:29), spiritually born of Abraham’s “bosom.” Lazarus being carried into Abraham’s bosom* symbolizes the “grafting in” of believing Gentiles to a place once possessed by Israel (Romans 11:11-24). *NOTE: The King James Version and the New American Standard Bible, which are both literal word-for-word translations, say that Lazarus was “In” Abraham’s “bosom” in verse 23. NOTE: You can purchase a low-priced book version of SHEOL KNOW, which is freshly edited and contains additional material here (339 pages); or you can get the eBook version here for only $2.99. Both links allow you to “Look inside” the book. For years I accepted (Luke 16:19-31) as a literal account on the state of the unsaved and unsaved after death because to put it plainly many evangelical bible teachers and theologians I respected said it was ! I got into this mindset that any other interpretation on those passage of scriptures was the false teachings of the christian cults and they were to be avoided. A couple of years ago I started to read articles on the subject of hell on the web and was surprised to know that bible teachers such as E.W Bulllinger, Charles Welch, Edward Fudge, and others did not believe hell was a place of eternal conscious torment for the unsaved. My whole thinking on what hell really was completely changed after reading what these men had to say. Ultimately it is the word of God (2 Tim. 3:16) that either proves or disproves what hell really is e.g our Lord was dead in both soul and body in hell (Psalm 16:10 & Acts 2:27-31). Paul states our Lord had victory over death through the resurrection from the grave (1 Cor. 15:55). The word “Grave” (or “death”) is translated as sheol (hades) in the Old Testament passage it’s quoting (Hosea 13:14)! Is (Luke 16:19-31) a commentary from our Lord Jesus on what happens to man after death? What sin did the rich man commit to end up in fire and torments and what righteous thing did the poor beggar Lazarus do to be in paradise (as some call it) with Abraham? Our Lord never mentions this ! My conclusion is that (Luke 16:19-31) is a mocking story or parable directed at the hypocritical Pharisees who were listening to Jesus (v. 14) and was exposing their false ideas on the afterlife. The wages of sin is death (Rom 6:23). If a person dies in their sins without Christ to save them (John 8:24 & 1 Cor. 15:1-4) then they will have eternal death (never to exist anymore) not eternal torment. I had to slightly edit your post regarding your comment that the Greek word for “grave”/”death” in 1 Corinthians 15:55 was hades. This is not true; the Greek word is thanatos. However, that verse is quoting Hosea 13:14, which uses the Hebrew sheol, which of course corresponds to the Greek hades (as a comparison of Psalm 16:10 and Acts 2:27 shows). Also, please keep in mind that hades/sheol and the lake of fire (aka Gehenna) are not one-and-the-same. An un-regenerated person’s dead soul is housed in sheol — “the realm of the dead” — UNTIL their resurrection wherein they’ll be judged and whoever’s name is not found in the book of life is discarded in the lake of fire, which is the “second death” (Revelation 20:11-15). This is where soul & body will be wholly destroyed/consumed by raging fire (Matthew 10:28 & Hebrews 10:26-27,31). For details, please read SHEOL KNOW; here’s the Contents Page, which provides access to each chapter. What is the “paradise” Jesus mentions to the criminal as they both hung on crosses? That passage is addressed in the next chapter here. Someone referenced your teaching on the Rich Man and Lazarus and I read what you set forth. For what it’s worth, I agree with you 99%. Pretty good, since you point out no one agrees with anyone 100%. 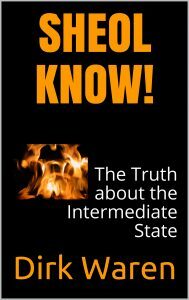 According to the principle of divine interchange, I believe Sheol=Hades=the state of death. I also do not believe in eternal conscious torment. The whole point of the Rich Man and Lazarus was to ridicule the teachings of the Pharisees. In other words, this story is not a parable, but a biting satire. The Pharisees taught that the poor were in disfavor with God, and the rich were favored of God. To help the poor would therefore be going against the will of God. There was a great gulf fixed between the two classes and no one could cross over from the bad side and of course no one wanted to cross over from the good side. Jesus did not condemn the Rich Man, nor did He praise Lazarus, whom I don’t see as a righteous person. As you point out, this is a symbolic tale that makes many potent points; but, in the form of an exquisite satire, which is holding something up to ridicule. Yes, Jesus mimicked their beliefs to rebuke them. Considering the context, the setting and the audience, this is truly remarkable. It hit the mark precisely. He lashed them with their own words as with whips of scorpions tales, and they seethed with rage against Him. Thanks for the insightful feedback, Louis. It’s a good point and this verse is true, but — at the same time — we need to be careful to not negatively judge a brother or sister who’s going through a trial and suffering lack for a spell, like Paul (Philippians 4:11-13) and, of course, Job. The latter was praised by the LORD Himself as the most righteous person on the face of the earth (Job 1:8 & 2:3) and yet he lost practically all his wealth during his extended God-permitted trial, which lasted months (Job 19:20) until the LORD restored him and doubly blessed him (1 Peter 5:10). To negatively judge either Paul or Job when they were suffering lack would be akin to being Job’s ignorant friends. Not that you said anything wrong — so please don’t take what I’m saying that way — I’m just offering additional scriptural details in the name of balance for anyone who might read these words. Thank you for this truth. I seek truth and wonder how learned pastors could be so wrong on this topic. Do they not have the spirit of truth in them? I love them, as all have fallen short, but think they are wrong about eternal suffering. What is your understanding of different levels of punishment? Do you believe the severely wicked will perish or will they pay their debt – then perish, for example? I currently believe in a judgment, a punishment applicable to the debt, then eternal destruction. Thoughts. I seek truth and wonder how learned pastors could be so wrong on this topic. Do they not have the spirit of truth in them? I’m sure most of them are genuine believers who sincerely love & serve the LORD. The problem is ignorance usually due to superficial studies and the bias of sectarianism. The Holy Spirit is the Spirit of Truth, but the Spirit cannot help someone see the truth if they choose to be lazy in their biblical studies or blinded by the “yes man” mentality of sectarianism. These and other reasons are covered here. What is your understanding of different levels of punishment? Do you believe the severely wicked will perish or will they pay their debt – then perish, for example? I currently believe in a judgment, a punishment applicable to the debt, then eternal destruction. The wages of sin is death (Romans 6:23) and there is some amount of suffering in any death, even if it’s just a split second. As our substitutionary death, Jesus died in our place and therefore suffered the wages of sin for us. Needless to say, the last hours & minutes of his life on earth involved great suffering. Literal everlasting destruction allows for all the conscious pain that divine justice might require for any sinner to suffer according to his or her personal degree of guilt. You can read more here. Thank you very much Mr. Warren! I was listening to my favorite Bible teacher online, out of the Calvary Church family, and he stated that we all live forever, just some of us apart from God. I was shaken, almost literally. It went against my idea of God’s nature. I come from a family and friend group of non-believers and I worry about their fates. Here was a man who teaches me insights I have not been able to glean on my own telling me something that absolutely did not resonate with me. I prayed with more passion than almost ever for the answer. I immediately found your site. You have helped me understand this perfectly! One question that remains: Is it possible that there is a punishment apart from a time lapse related relegation to the Lake of Fire during the Eternal Destruction? We see in Revelation 3:9 that those of the synagogue will be forced to worship at our feet. Thoughts. Thanking the Holy Spirit for guiding me to your teaching. God bless. I wouldn’t call this “worship,” more like just being humbled in the presence of their enemies — the Philadelphian believers — forced to acknowledge that these believers are genuine while they are counterfeits. No doubt this will take place on the Day of Judgment when they stand before God for judgment (Revelation 20:11-15). Although these Jews were Hebrews physically they were not true Jews, but rather spiritual pagans (cf. Romans 2:28) who allied with other pagans in putting believers to death as they tried to snuff out Christianity. After rejecting the Anointed One (Christ) first Century Judaism became as much a tool of the devil as emperor worship. Thanks for the feedback and God Bless You, Ryan. Would Jesus use a falsehood to teach a truth? I wouldn't think so and that is what I think of the symbolic interpretation of the parable. I see your points and they seem somewhat valid, but I am having a hard time believing that He would use a falsehood to convey a truth. As I stated above, I believe His main point was that they would not believe even if someone rose form the dead, as they never even listened to Moses and the Prophets. Thanks for the feedback, Joshua. If Jesus’ tale of the rich man and Lazarus was a literal accounting of the nature of Sheol/Hades — a true accounting — then that would make the hundreds of other references to Sheol/Hades throughout the rest of the Bible false, including YHWH’s own descriptions. Before you disagree, read through the rest of Sheol Know and observe for yourself what the rest of the Bible clearly and consistently teaches on the topic. Here’s the Contents Page that provides access to all the chapters. This chapter on the Parable of the Rich Man and Lazarus is the eighth chapter in a twelve chapter book, plus an epilogue. Secondly, Jesus’ tale of the rich man and Lazarus is false in the sense that the events didn’t really happen just as all symbolic stories didn’t really happen, like Tolkien’s Lord of the Rings trilogy. While you can glean many truths from Tolkien’s imaginative stories and a lot of the things that happen in them reflect real life these tales are false in the sense that they didn’t really happen, not to mention the obvious fantastical elements, which designate them as fantasy, not reality. What about Jesus’ other parable that takes up the first half of Luke 16 (and starts with the exact same words as the Rich Man and Lazarus), The Parable of the Shrewd Manager: The events in this story never happened. Is Jesus therefore guilty of teaching “falsehood”? As you go through Sheol Know you’ll discover that the nature of Sheol/Hades is a massive topic involving literally hundreds of Scriptures. Please take your time going through the material while seeking God in prayer and I’m confident you’ll come to a sound conclusion. God Bless You as You Seek & Serve. This is what I believe the parable was aimed at conveying: That they would not listen even if someone was to rise from the grave, meaning Christ.